Whitstable Wellness Centre offers a broad range of therapies and groups from Alexander Technique to Yoga and many other specialities in between ( for the full list please see our Practitioners section below). The Centre has a light and comfortable studio that is perfect for group exercise and therapy. Situated in the heart of Whitstable, conveniently placed for the people of Whitstable and surrounding areas. I have enjoyed using the facilities at Whitstable Wellness Centre. Having attended a couple of classes I enjoy the fact that I can walk within a few minutes from home. I am pleased with the class that I attend and feel very comfortable in the calming surroundings. I am looking forward to bringing my baby along to the mother and baby groups soon. Whitstable Wellness Centre has highly qualified and experienced practitioners providing excellent care and instruction. All our practitioners manage their own bookings and enquiries, please contact them directly using the details below. Our Studio is for hire for small groups and classes at a competitive rate. Please see our contact page for more info. 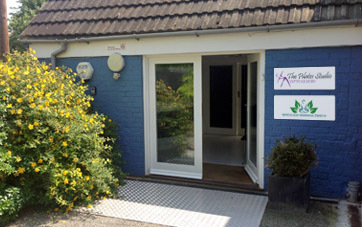 The Pilates Studio Whitstable is based within the Whitstable Wellness Centre. Pilates classes are instructed by registered Osteopath Gemma Dawson and Andrea Creary experienced Pilates Foundation Instructor. Pilates improves spinal stability and overall muscular strength. It is beneficial to people of all ages from those who wish to improve their posture and generally tone up to those who are in need of altering their spinal function for the better. Yoga for Kids Free Taster Session at Whitstable Wellness Centre on Monday the 19th of August 10am to 11am. Monica is a highly experienced Yoga instructor providing classes at Whitstable Wellness Centre. Monica has practiced yoga for 15 years. As a yoga teacher she aspires to inspire students to listen to their bodies and learn to explore and experience the connection between movement and breath to improve postural habits. A mixture of Hatha and Iyengar Yoga designed to stretch, massage and relax you. It is a chance to start to bond with your baby get to now your changing body and meet other pregnant ladies all within a friendly class. Providing positions for birth and top tips for labour. Linda practices a combination of Yoga techniques to encourage relaxation and breathing, helping to improve posture and overall well being. Gentle stretching for both mum and baby plus relaxation and breathing techniques and fun interactive bonding sessions. Michelle is a fully qualified holistic massage therapist practicing a range of massage techniques including Swedish Massage, Indian Head Massage, Deep Tissue Massage and Pregnancy Massage. Since having her own babies Michelle has specialised in the treatment of women during pregnancy and labour including the preparation for birth, as well as new mums and babies/toddlers. She is qualified to teach Baby Massage & Baby Yoga with the guild of Baby Sensory and Development and has been teaching both to groups of parents and on an individual basis both privately and thru Kent Sure Start Childrens Centres since 2010. Michelle offers a range of 5 week courses and one hour workshops for babies from 8 weeks through to one year. Offers the space to exercise postnatally in a supportive environment. Work at your own pace to reconnect with your body, strengthen your core, stretch out and release tension. With or without your baby, the class has a friendly atmosphere. Postnatal Pilates is a great way to reconnect gently with your body. As the body has been through so many changes throughout pregnancy, it takes time for the body to adjust. Joints will still be unstable and muscles weak As with antenatal Pilates each session is adopted to the individuals needs and comfort level Pelvic floor exercises can be done straight away. Postnatal Pilates can start 6 - 8 weeks after birth 8 - 13 weeks after c-section. During pregnancy the body experiences many hormonal and muscular changes which puts stress on the body and cause muscles to weaken, ligaments to stretch and joints to over load. The body becomes unbalanced, and the unbalanced body loses stability and strength. Pilates during pregnancy helps the body as it goes through these changes, improving posture, balance and muscle tone without placing placing further stress on the body. Pilates is an adaptive form if exercise, meaning that the body is assessed throughout each session and exercises are adaptive to suit individuals needs and comfort level. Antenatal Pilates benefits by realigning posture, helping to prevent pregnancy related back pain by stabilising the pelvis, spine and shoulders and maintains the integrity of the pelvic floor at the same time preparing the body physically for birth with the added benefit of meeting other expectant mothers. Wholeness Technique is a combination of Alexander Technique and a deepening awareness of mind and body. Learn to move with freedom and ease away from pain and suffering. Receive practical guidance and experience a more balanced body reducing negative thought patterns. Classes are suitable for most ages and abilities. Hypnobirthing helps you release negative fears about birth, how to trust your body and work with it, freeing yourself from fear that leads to tension and pain. Benefiting mother, birth partner and baby. Mindfulness is a mind body approach that helps people change the way they think and feel about their experiences, particularly stressful experiences. Mindfulness is a self-help therapy that can help people begin to recognise their habitual patterns of mind and assits in changing your approach to life. Lorraine is UKCP accredited and registered Integrative Psychotherapist and clinical supervisor. She has worked therapeutically with adults, children for individual and in groups for almost 30 years. Lorraine is also a trainer and tutor for both Psychotherapy and counselling courses in London . Specialising in teaching Child development, trauma and abuse and transpersonal psychotherapy. Lorraine has been teaching Mindfulness for the past five years. She was trained at and supervised from The Centre for Mindfulness at University at Bangor. f you would like to book on a Mindfulness course with Lorraine please contact her on 01227 454323 or email at lorraine.millard@ramseu.com. All our practitioners manage their own bookings and enquiries, please contact them directly using the details above.